I am very impressed with the service I received from Cable Chick. The order was processed and received very quickly. The product ordered was the wrong cable for my needs, I sent a photo with my revised order only to find the product was not stocked and a total refund was offered (even return postage was paid). You should be proud of your staff (especially Roy) and their commitment to customer service. HDMI Wall Plate products for the best quality AV Accessories at the lowest prices every day! 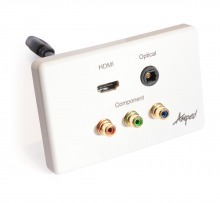 Amped Classic Double HDMI (White Wall Plate) + FREE SHIPPING! Amped Classic HDMI, DVI & Component (White Wall Plate) + FREE SHIPPING! Most Popular HDMI Cable! In-Stock & Ready to Ship!